Are you taking psychedelics or MDMA, or do you want to try it? If you are you will need a test kit to safeguard your health. We recommend a variety of test kits depending on the substance you are testing: Marquis, Ehrlich, Mecke, Simon's and Hofmann. WHICH TEST KIT DO YOU NEED? HOW TO USE A TEST KIT? Take a small piece of the pill, the powder or blotter and place it in the test tube. You only have to use a very small portion - about 1/10 of the blotter, a very small portion of the powder or a few crumbs scraped of the pill. Drip 1-2 drops of the testing liquid into the test tube and close the lid. You do not have to shake or stir it, as long as the liquid is in contact with the drug. A chemical reaction sets of immediately and the liquid will change colour. Compare these colours to the diagram on the inside of the glass lid. Watch the video below for a detailed guide. HOW MANY TESTS CAN YOU GET FROM ONE TEST KIT? One test kit contains 5 ml testing fluid with the possibility of 100 tests - depending on how careful you are. One drop is all you need. HOW SHOULD I TEST MDMA? 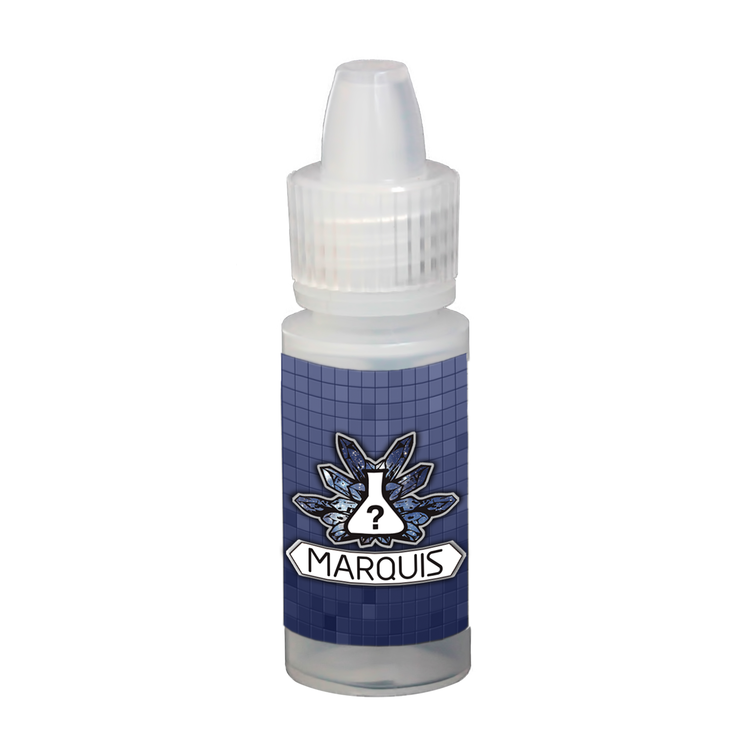 - The Marquis test kit should be your first step towards testing MDMA. There will be a glimpse of a strong and “royal” purple for as short as half a second, and up to five seconds. There should not be any shade of yellow, red, green or other colours. That indicates a mix of several drugs. The purple colour will shift into black quite rapidly. If the colour goes straight to black you should do a secondary test. A reaction straight to black does not necessarily mean it is not MDMA. It can also be a sign of high purity. To make sure it has not been falsified you can swirl the fluid in the test tube after the reaction to check and see if the thin edges of the fluid is purple. Another way is to hold the test tube up against the light to make sure it has a deep purple colour that looks black. Be on the lookout for a muddy black colour. It can be proof that you are dealing with a mixed drug. If the liquid is purple for a longer period (more than 5 seconds), it is NOT MDMA. - The Mecke test kit should be used as a follow-up test because it reacts to different additives in MDMA. It reacts with the dark green colour from half a second up to three seconds. But again you should be aware of glimpses of other colours during the first seconds of the reaction. - The Simon's test kit is the final step and can differ between MDMA and MDA. MDMA will change to the colour purple, whereas MDA will not react to the liquid at all. HOW SHOULD I TEST LSD? -The Ehrlich test kit should be your primary choice. With the Ehrlich test kit, LSD will change colour to pink and then to purple quite rapidly. LSD on a blotter can be tested as is, but liquid must be treated a little differently. Liquids should be placed on a piece of untreated paper. Allow it to dry before you use the test kit. If the paper is treated it will react with the fluid in the test kit. You can check this by adding a drop of the testing liquid on the untreated paper. If the paper does not change colour it is ok to use it in your test. - The Hofmann test kit is the follow-up test for LSD and should turn pink / light purple. HOW SHOULD I TEST PSYCHEDELIC MUSHROOMS? - The Ehrlich test kit is excellent for testing psychedelic mushrooms / psilocybin. Grind a very small portion of the mushroom and place it in the test tube. The liquid should turn pink and then purple, if the sample actually is psilocybin or psilocin - the active ingredients in psychedelic mushrooms. For more information about test kits, download the Bunkleaks app. A tested sample should not necessarily be considered safe. There are many factors to consider when examining reactions – the mixture of several drugs, lighting etc. Test kits distributed by EmmaSofia are meant for identifying unknown substances. The objective is risk reduction.